I started writing a novel last month. That sentence alone makes me wonder if I’ve officially lost it. Go ahead and commit me. Throw away the keys. Arden thinks she’s a novelist. I’ve only been writing since March. Sure, I learned to write as a child. I remember writing a horror story in elementary school. It was so gruesome that I believe the teachers all took bets on when I would officially turn into the psychopath I was destined to become. Other than that, I’ve never written fiction. I’ve written term papers on The Patriot Act and Darfur. Hasn’t everybody though? Most people have to write for school. Most people don’t write for the sheer fun of it. Out of nowhere though, I decided I wanted to write. Back in March, I launched my blog. Sure, it started out as a joke; a place to whine about an annoying coworker. I never really expected it to last. I thought it would most likely become another hobby lost to a busy schedule and lack of interest. 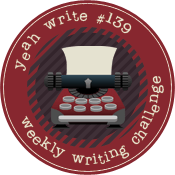 Over the summer, after diving into a few flash fiction challenges, I stumbled upon NaNoWriMo. For those of you who don’t know, NaNo takes place during the month of November and people all over the world attempt to write a novel in thirty days (50,000 words, to be exact). This is where I think I started to lose it. Who, after writing recreationally for only a few months, decides to write a novel? In 30 days, no less? A crazy person, that’s who. I was not to be deterred by my rational thoughts. On November 1st, I hunkered down and started pounding out word after word after word. For thirty straight days, I wrote as much as I could in every spare moment I could find. By the time November 30th rolled around, I had done it. While the novel was not finished, I had written 50,000 words. It didn’t necessarily surprise me that I ‘won’ NaNo. I figured I could spout enough nonsense on the page to make it to 50,000. What surprised me was that I didn’t think the words were half bad. Sure, I had a ton of editing to do, but for a first draft, it wasn’t too shabby. Not too shabby at all. Google baffles me at times. Just when I think it can’t get any smarter, it gives me something I need; something I didn’t even know I was looking for. I shouldn’t be embarrassed to tell friends and family that I’m writing a novel. I should be proud. No matter if it gets published or sits on my hard drive for eternity, so long as I finish it, I can say I wrote a book. How many people get to say that? I’m trying to teach myself that it’s okay to have big dreams. While it is smart for me to stay grounded, keep my day job, and pay my bills, I can spend my spare time working on something bigger. You’re never too old to pursue something you love, even if it’s something brand new to you. I’m going to finish my novel and I’m going to be proud to say that, no matter where it actually takes me. 🙂 Yeah! You’re the best. I love that quote. Good going on moving forward with your writing! That’s awesome! Thanks so much 🙂 If anything, finding something new I enjoy to do is always exciting! Amazing! And it’s thrilling to find something new that satisfies you. It just might be your calling. And regardless, it’s something to be hugely proud of. Thanks! I’m trying to think that way 🙂 I just seems so silly to me to tell people I’m writing a book. I don’t know why it embarrasses me! I’ve only just this second discovered your blog and already I love you. Seriously, this is such a relevant and brilliant post, thank you. I must dash now but shall return to check out more pearls of wisdom. It was already a pretty good 2013 but that comment has just made my year! You’re totally a novelist! How fun! Great job getting to the 50K word mark. Great job understanding that we are never too old to find something new to do, something new to love. I hope you continue to love writing, because you have a knack for it. Congratulations on your first draft. I want to write a book, too, but I can’t quite get started. Good on you. I’ve yet to successfully complete NaNo! It was tough. I stopped immediately at 50,001. I was over it by Nov. 30th! You should definitely be proud of yourself! And who cares what people think, if you want to write a novel, then you should. Period. I think that at some point I will write a novel, but I am so much slower with these things than you. I’ve had my blog for a year and a half now, and am only just now dipping my toe into writing fiction. The thing is, it takes me so, so long to edit a blog post or a short story, it scares me to think of editing a full length novel. One page at a time, I guess, right? Good for you. Just keep going and stop assuming everyone else is better than you are. I try and remind myself of that every day. Writers need some kind of mantra to keep their heads above–but still in–the fray, no? Way to go. Good for you! I seriously lack the discipline.